Phoenicia, Tyre. Shekel, 14.29gg. (12h). 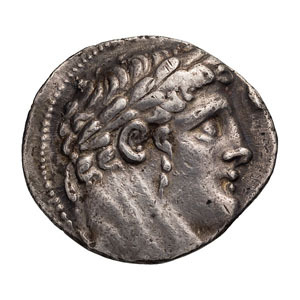 Phoenicia, Tyre, Year 51 = 76/75 BC. Obv: Laureate bust of Heracles (Melqart) right with lionskin (off flan) knotted around neck. 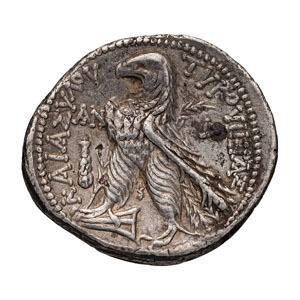 Rx: TYPOY IEPAΣ - KAI AΣYΛOY Eagle with closed wings standing left on prow, with palm branch behind shoulder and Phoenician letter between his legs; date AN and club in left field; Δ in right field. Cf. BMC 142-3 (Years 50 and 52; Year 51 not in BMC). EF.